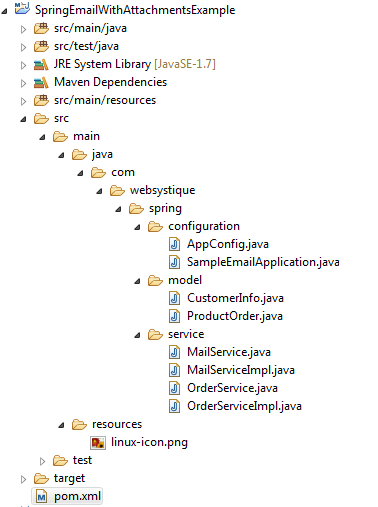 Spring provides org.springframework.mail.javamail.MimeMessageHelper class which act as a Helper class for populating a javax.mail.internet.MimeMessage. It offers support for HTML text content, inline elements such as images, and typical mail attachments. In other words, it helps preparing a Multi-part MimeMessage’s. Let’s get going. As we saw in previous tutorial, Spring’s org.springframework.mail.javamail.MimeMessagePreparator Callback interface comes handy for the preparation of JavaMail MIME messages. We can use both MimeMessagePreparator & MimeMessageHelper to finally create a MimeMessage with attachment or inline content. Below method returns a MimeMessagePreparator consisting an MimeMessage which in addition to text, contains an image as an attachment. Below method returns a MimeMessagePreparator consisting an MimeMessage which includes inline resources. Inline resources can be images or a stylesheet included in your message, not as an attachment. // Add an inline resource. Take special note that inline resources are specified using Content-ID [cid:]. In above snippet for inline content, you can see that we are preparing HTML right in helper. Spring provides a better option to handle HTML content using Template libraries [Velocity, Freemaker,..], thereby seperating the domain logic from view[Email template in this case]. You can create a specific Email template for your application, and include that in all your messages. Post Spring 4 Email Tutorial using Velocity/Freemarker Templates shows that in action. Once you got the MimeMessagePreparator, message can be send using JavaMailSender. //Put Other Application configuration here. Please do not forget to update above configuration with your [email] credentials in order to run this example. Important: In case you are getting problems while connecting to Gmail, check first if you have two step security enabled in your gmail. 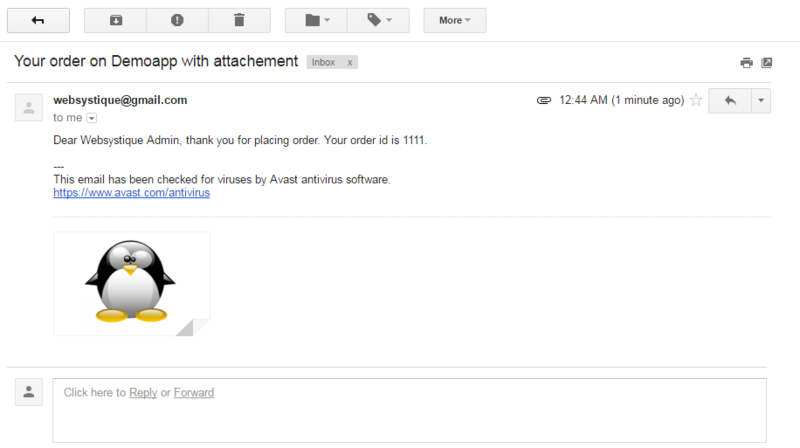 Additionally, check if you have received an email from provider[gmail] saying “Sign-in attempt prevented”. If yes, there will be instruction in that email on how to allow/disallow less secured apps to access your mail provider [Turn on/off access to less secured apps]. Run the mail program, and check your [customer] mailbox. You should see two new messages. DEBUG SMTP: Found extension "SMTPUTF8", arg ""
DEBUG SMTP: Found extension "AUTH", arg "LOGIN PLAIN XOAUTH2 PLAIN-CLIENTTOKEN OAUTHBEARER XOAUTH"
Dear Websystique Admin, thank you for placing order. 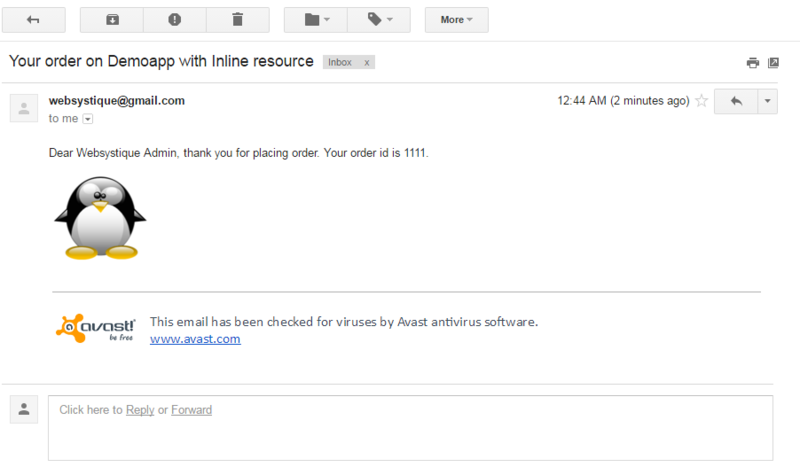 Your order id is 1111. That’s it. As we saw, it’s rather easy to use Spring’s email support in your own application. Feel free to comment, and suggest improvements.